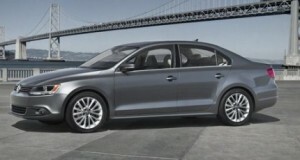 Volkswagen India is planning to launch the new Passat luxury sedan on March 29th, 2011 according to Autocar India. The price of the next-generation Volkswagen Passat will be marginally higher than the current model. Volkswagen has incorporated the new family grille in the new Passat which now looks similar to Phaeton. We had reported on the upcoming launch of the new VW Passat and Jetta in December last year. The new Passat is actually the seventh generation car in Volkswagen’s product portfolio. The luxury sedan is 4 mm longer than the current Passat model sold in India, but the width and height are same. Besides, it will share the same basic structural and mechanical components of the old Passat. The 2011 Volkswagen Passat’s chrome tipped horizontal lines and the sharp-looking tail lamp will boast the German brand’s new design language. The Passat also features a new tail lamp with elegant turn indicators and large red glowing area. The new Passat has rub-rails at the rear bumper coated in chrome enhancing the premium sedan’s appeal. The 2011 Passat for the Indian market will be offered with two engine options: the 1.8 TSI petrol engine and 2.0 TDI diesel engine. The 1.8 litre TSI petrol engine produces 157.8 bhp of maximum power and 250 Nm of maximum torque. The 2.0 litre TDI diesel engine produces 170 bhp of maximum power. Expect the engines to be mated to manual as well as DSG (Direct Shift Gear box) transmissions. The new Passat, if priced competitively, would pose a stiff challenge to the likes of Honda Accord V6, Nissan Teana, Skoda Superb and Toyota Camry. Volkswagen’s ambition is to become the world’s largest car maker by 2018 will be possible only if the company has a significant share in fast-growing markets such as India and China. The German brand is making the right moves towards its ambition by delighting its Indian customers with latest generation models line up. The company is also planning to launch the next-generation Jetta this year. Currently Volkswagen is on a high in India thanks to the good reception for its small hatchback car, the Polo (diesel and petrol) as well as the mid-size sedan Volkswagen Vento.